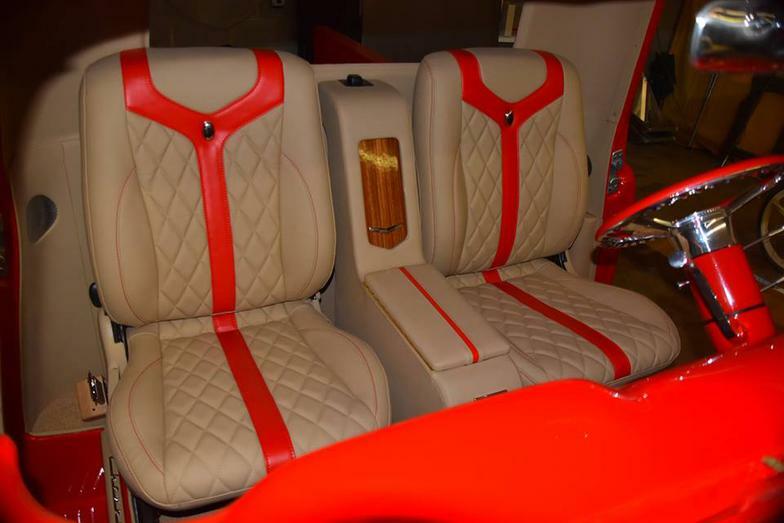 Fully hand crafted Desert Rave simulated leather with Cashmere Synergy Suede interior featuring; modified and wrapped engine cover, custom built door panels and walls with sculpted armrests, polished trim work, and integrated LED accent lighting. Custom designed rear armrest with usb charging ports, spare tire, and amplifier storage. Custom built fold out rear seat with embroidered rear curtain, built in usb charging, LED accent lighting, and speaker/subwoofer ports. One piece front to rear carpet with illuminated stainless sill plates. Smooth one piece headliner with hand crafted color matched overhead consoles featuring accent lighting and polished aluminum trim. 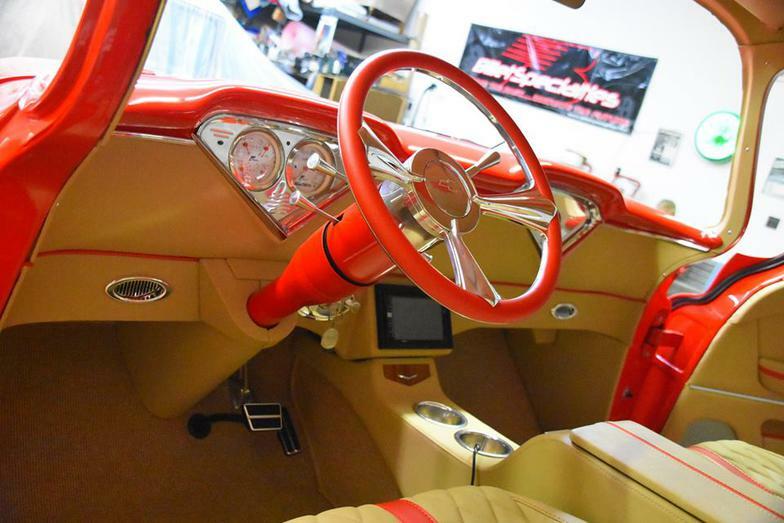 Fully custom built light sand solstice interior with crimson madrid grain vinyl accents featuring; a scratch built custom console, under dash modesty panels, and lower steering column cover. Custom dash including custom machined billet inserts and polished trim. Fully wrapped upper doors including custom built fiberglass garnish moldings. Multi layer door panels with sculpted armrests, polished trim work, zebra wood veneer, and integrated LED accent lighting. Custom designed and wrapped seat risers with integrated LED accents. Tan german square weave carpet finished off with custom sill plates featuring Chevrolet script badging. 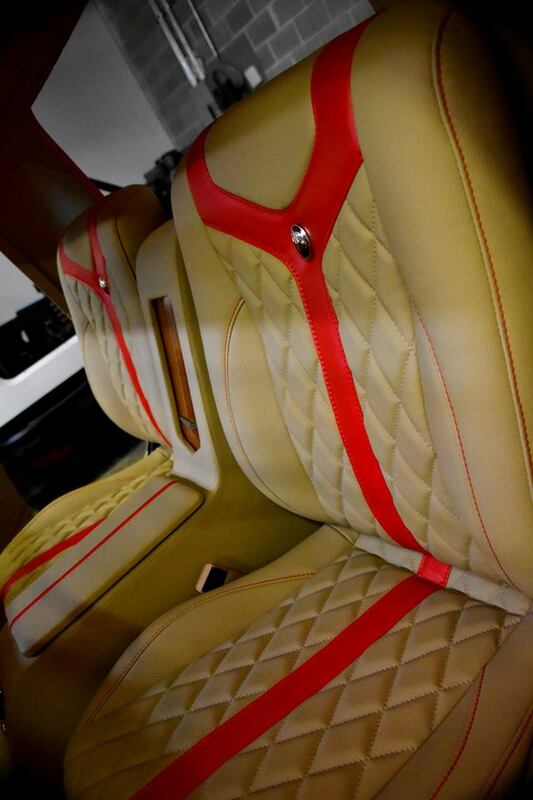 Custom reshaped Honda Civic seats with top stitched diamond inserts, red contrast stitching, and custom polished seat fobs. Fully custom built interior using amber and mine shaft Relicate full grain leather with charcoal synergy sued covering the scratch built headliner and sail panels. Featuring; an extensively modified and recovered Corvette C6 dash, housing in dash gps and Dolphin gauges. Hand built rear seats to mimic the fronts, seperated by a scratch built console housing led illuminated cup holders. Fully wrapped doors, housing multi layer door panels with sculpted armrests, Fessler handles, billet door pulls, and integrated LED accent lighting. Modified Hyundai Tiburon seats with embroidered mustang accents and color matched plastic trim. Charcoal german square weave carpet finished off with polished aluminum sill plates. Fully custom built Bobber brown Relicate leather interior with Cashmere synergy suede headliner and seat inserts. Scratch built custom console housing power window switches, vintage GM shifter, and illuminated cup holders. Under dash modesty panels housing vintage air AC vents. Kick panels with integrated perforated aluminum speaker grills and tweeters. 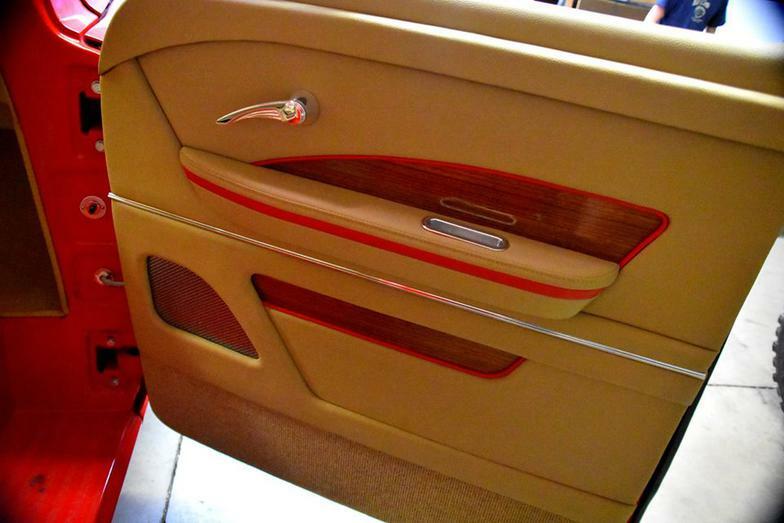 Contoured door panels with 56 Nomad armrest bases and pads. Custom designed and wrapped rear seats with integrated storage, speaker boxes, and led accent lighting. Cream essex carpet finished off with custom sill plates. Extensively modified 2001 Suburban seats with re-webbed three point seat belts.